If your clients have moved away from home, and in particular, if they have left loved ones behind, then they will no doubt miss their old home, family and familiar surroundings. Many children feel homesick when they first go on holiday without their parents, however adults who feel the same way can find it difficult to integrate as well as they could and this can spoil the enjoyment of what could be a wonderful new opportunity for them. Instead of dwelling on their old way of life, your clients can begin to feel more optimistic about their new home, which will help them in those early settling in days. 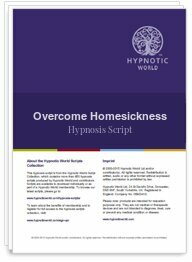 Download this Overcome Homesickness hypnosis session today to help your clients to feel happier in their new surroundings.